The RKB Group keeps on developing its skills in producing big size spherical roller bearings with pressed steel cage. 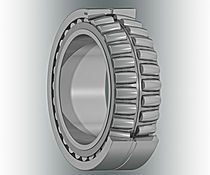 The capability to manufacture rolling bearings of such dimensions (420 mm bore diameter) with pressed steel cage derives from the long-standing experience of RKB and its leading-edge manufacturing technology. These two factors put the Swiss Group in the same bracket as the few market leaders that can currently meet similar technical requirements.